UK researchers have unearthed ancient fossil forests, thought to be partly responsible for one of the most dramatic shifts in the Earth’s climate in the past 400 million years. The fossil forests, with tree stumps preserved in place, were found in Svalbard, a Norwegian archipelago situated in the Arctic Ocean. They were identified and described by Professor John Marshall from Ocean and Earth Science at the University of Southampton and Dr Chris Berry of Cardiff University and. Professor John Marshall has accurately dated the forests to 380 million years. This was done using fossil spores (pollen from plants without seeds) and makes them over 20 million year older than previous age estimates. 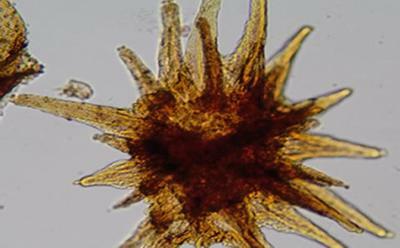 “These fossil spores are often quite beautiful objects and we can use their evolution to tell geological time”. “They are much used for both scientific projects and in the energy industry for identifying oil and gas reservoirs,” said Professor Marshall. Although the earliest land plants are much older, these were rather weedy and it was only from the Late Devonian that the first forests spread across the Earth as permanent features of the landscape. At this time Svalbard was located on the equator, its tectonic plate has subsequently drifted north by around 80° to the current position in the Arctic Ocean. The team found that the forests in Svalbard were formed mainly of lycopod trees, better known for growing millions of years later in coal swamps that eventually turned into coal deposits – such as those in South Wales. They also found that the forests were extremely dense, with very small gaps – around 20 cm – between each of the trees, which probably reached about 4 m high. They would have been thickets. We often call them “Twiggy Forests” as you would need to be a Size Zero to get between the trees. Forests pull CO2 out of the air through photosynthesis – the process by which plants create food and tissues – and the formation of soils. Because of the high temperatures and large amount of rainfall on the equator, it is likely that it was the equatorial forests that contributed most to the ~15-fold drawdown of CO2 (carbon dioxide) from the atmosphere around that time. This changed forever the way the Earth’s biological and chemical cycles worked. The long term decline in CO2 coincided with the Earth System becoming much more unstable and it subsequently went over catastrophic tipping points. These tipping points happened at least twice, as shown by the Late and End Devonian Mass Extinctions. Svalbard is currently one of the most northernmost inhabited areas in the world with a population of around 2,500. Svalbard now plays host to the ‘Global Seed Vault’ – a secure, underground frozen seed bank in which a large variety of plant seeds are preserved. The vault functions to provide a safety net against a loss of diversity in a global crisis. The new findings have been published in the journal Geology.